In the Guru Parampara tradition, every year on the day of Aashad Purnima, the devotees and disciples gather to pray, revere and extol the infinite glories of Pujya Guruji Shri Shri Nimishananda. This year too, we celebrated Guru Purnima in a very unique way. As per the guidance and instructions of Pujya Guruji, we had organised a sadhana retreat programme in Shreyas, an Ayurvedic, health and a spa resort on the outskirts of Bangalore from 8th July to 10th July 2017. We set off for the resort on the morning of 8th July after seeking the blessings of Pujya Guruji. We were greeted very traditionally with garlands , Aarti and kumkum by the staff of Shreyas, who were very gracious and elegant looking. The vast expanse of flowering trees, shrubs and greenery spread over 20 acres was very delightful, refreshing and rejuvenating, a perfect ambience in the timeless beauty of Nature. After a satisfying lunch, which was perfect blend of Indian and western cuisine of subtle flavours, taste and aroma, we gathered in the Meditation hall. 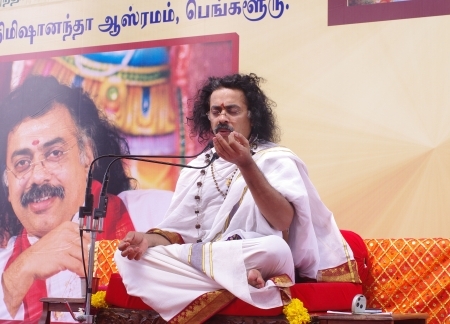 We began the first session of the Kundalini Empowerment Yoga Sadhana with invocation, garlanding Pujya Guruji with the Tatvamala and singing bhajans. Pujya Guruji explained the purpose of initiation to the ‘Kundalini Empowerment Yoga Sadhana’, the importance and the effects of the energies in different chakras of our body and how the activation of each chakra would lead us towards empowerment and enlightenment. “It is essential for you to know about your chakras and their vital energy points. They are the KEYS to maintain well being of your mind, body and soul. With this you can remove all the blockages of the mind and body thereby empowering yourself towards your own divine SELF. Each chakra has a beeja mantra or a seed syllable. When you chant it, the energy blocks in the chakra are cleared. You are filled with new energy, vitality and well-being. This prana- Life force energy flows into each and every node (nadis). Your vital energy, which is in your hormones and enzymes (rasa –dhatus) converges and empowers your psyche, your body and your mind. MOOLADHARA – Denotes your KARMA and DHARMA. It is the essence of human life, the root-cause of all your success and failure. The base energy of your – psychology, physiology, emotions, culture (samskara), spiritual nourishment and all other developments of life. ‘Lam’ Beeja mantra takes you towards the light of knowledge, fruits of your action, reaction, both in the conscious and the subconscious of your psyche. Here you begin the journey towards Self-Realisation without being affected by fate and destiny”. Pujya Guruji initiated everyone with the ‘LAM’ bija mantra of the first chakra – Mooladhara chakra. Each participant received a beautifully designed envelope with a card in it , which had picture of the chakra, the bija mantra and its importance. The envelope and the card had a unique fragrance which was relevant to that chakra. We were all asked by Pujya Guruji to inhale the fragrance which would help us in activating the chakra. Each participant also received an audio clip of the mantra on their mobile phones. Half an hour later we returned back to the meditation hall where tea and snacks were awaiting for us. Second session began after the tea break. We garlanded Pujya Guruji with another tatvamala representing the colours of swadisthana chakra. Pujya Guruji then explained the importance of the energies of the Swadhisthana chakra. The next KEY in the Kundalini Empowerment Yoga Sadhana is bija mantra of VAM of the Swadhisthana chakra. Defines the centre of your ego, self- respect, character, spirit, seat of your feelings and present state of mind. It also denotes your present life with respect to many past lives. The chakra lies in between the sleeping state and the wakeful state. You can bring your basal instincts under control, transform them and ultimately transcend them. With dedicated sadhana and Guru bhakti you can rise above swadhisthana and form your own future. We were given the next card of Swadhisthana chakra and inhaling deeply and absorbing the subtle energies of the characteristic fragrance of that chakra, we felt uplifted. We received the audio clip too on our phones. Swadhisthana chakra is associated with the water element, Jala tatva. So this time we sat around a water body in order to incorporate the energy of water into our being. We plugged in our ear phones and hearing the audio clip of the VAM mantra, we chanted the Bija mantra aloud with the proper intonation – chandas . This experience of chanting near a water body, we all felt a soothing feeling of inner peace and calmness while doing this mantra sadhana. 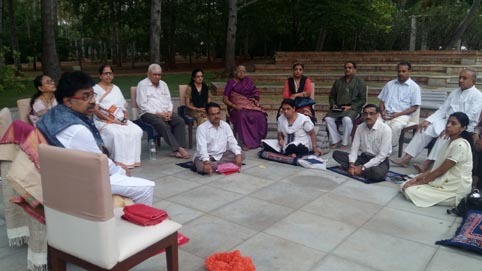 After about half an hour of our sadhana, we now walked in joyful anticipation, across the length of the resort, to a beautiful garden space where the next session of our sadhana was supposed to begin. The third session of the Kundalini Empowerment Yoga Sadhana was conducted for the activation and energising the Manipura chakra. The staff of the resort had created a wonderful setting of a campfire in the midst of a lush green garden. As the sun’s fading rays melted into the sublime enveloping darkness of heavenly moonlit evening, we sat in contemplative silence around a blazing flames of the fire. We garlanded Pujya Guruji with a tatvamala of the color of Manipura chakra. We received the envelope with the card of Manipura chakra. We energised ourselves by breathing in the fragrance of the Manipura chakra. Simultaneously we received the audio file of the chant. Pujya Guruji began to explain the importance of Manipura chakra for a healthy body and a healthy mind. ” MANIPURA – Cosmic Door that opens up to the consciousness (chaitanya) in you. Access the Manipura to learn the lessons of your life. Then, through the light of wisdom you develop mental purity, mutual respect, understanding, self- confidence, will power, stability, focus, good health, vigour and vitality. It is the “City of Jewels” that changes your life for the best as it is the centre of good luck (God’s grace), Tejas (Radiance), and is the access point for numerous astral powers (siddhis) of God. You transcend from the subconscious level to the conscious level with potent sankalpa Shakti (power of resolution) and Kundalini Empowerment Yoga Sadhana. The chants were played out on the music system so that everyone could chant together. Thus we began chanting the mantra with the proper chandas, intonation. The rhythm of the chants were so powerful that all of us felt charged, activated and could feel the fire of Manipura blazing within us. The sound of the crackling embers combined with the visual impact of power of the leaping flames of 4 – 5 feet height and the stillness of the air, all these made a deep, lasting impression on our psyche. At the end of the third session, we moved to a huge dining area enclosed in a tent. Pujya Guruji evaluated each participant ‘s chakra status and giving suitable remedies to correct them. Everyone shared their experiences about their feelings in all the three initiations. Dinner was served by the staff in a very peaceful and a serene way which marked the end of the day one of the LIFE CHANGING SADHANA.